Rainfall amounts, especially from thunderstorms, can vary widely in time and space. Meteorologists have been hopeful that a very new technique called "mesoscale modeling" will eventually be of great assistance. Yesterday, we had an example of the promise and peril of mesoscale modeling. This is a view of south central Kansas with the 4.5 (inches) over Wichita. 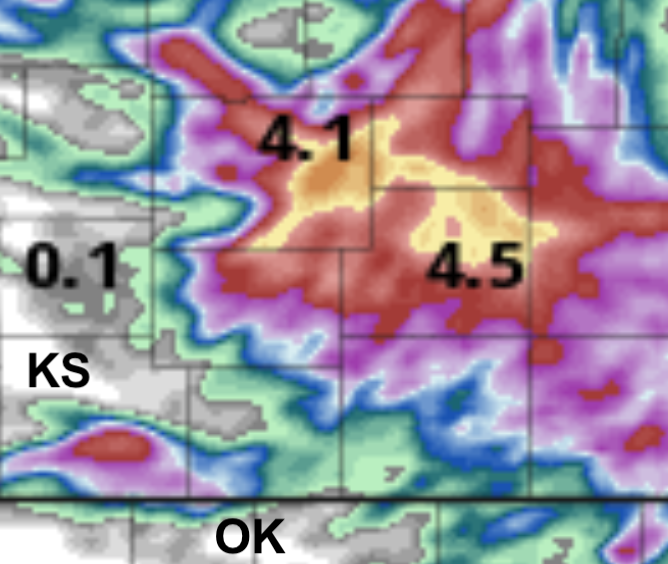 The darker brown are forecast amounts of 5.5 to 6.1 inches. The forecast was made from the 7pm data yesterday evening and applied to the overnight hours. In terms of the amount of rain, the forecast was remarkably good. Amounts in excess of five inches are highlighted. 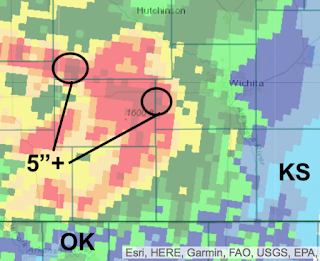 The issue is that the real-world heavy rain was roughly 15-20 miles farther west and south than forecast. For example, at Wichita's Eisenhower National Airport (the official reporting site) had .75 inches versus a forecast of 4.50 inches. A huge difference. I certainly see this as a "glass three-quarters full" situation. 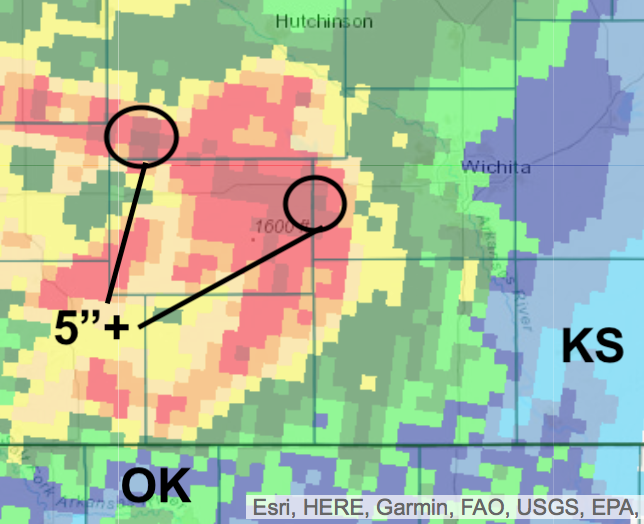 The amounts of rain were quite accurate and the locations were close enough to be useful -- but, the human meteorologist was required in this situation to monitor the radar and place any flood forecasts (with the drought, little flooding expected). So, while this is an excellent start, we still have a ways to go before these forecasts are good enough to be used on their own.